Illness: A loss of appetite can signal anything from a temporary upset stomach or parasites to ingestion of something inappropriate or even an intestinal blockage. 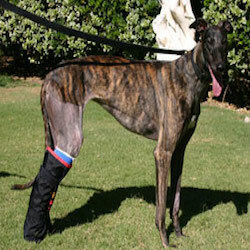 Therefore, if your Greyhound shows a change in appetite, a call to the vet is in order. This is especially critical if the loss of appetite is accompanied by panting, pacing, lethargy, vomiting, or constipation. Teeth: A loss of appetite can also signal a bad tooth. 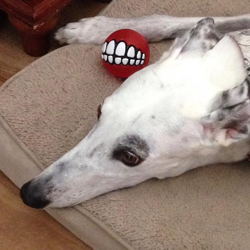 It is important to care for your Greyhound’s teeth with daily brushing and regular professional teeth cleaning. 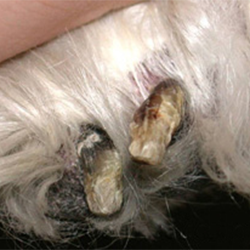 As you can imagine, a bad tooth is extremely painful for your dog. You can often guess that a dog has a bad tooth if he begins to eat but suddenly stops after a few bites. 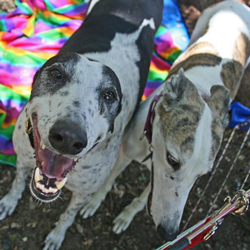 Overfeeding: While some Greyhounds will eat almost anything and everything regardless of hunger, other Greys will stop eating once they have had enough. The amount to feed a Grey will be based on the dog’s size, age, activity, and metabolism, but generally a 55- to 60-lb. female will need about 1 cup of dry kibble twice a day. A 70- to 85-lb. male will need about 1-1/2 to 2 cups of kibble twice a day. (And remember that treats count, too) Overfeeding may cause a loss of appetite, and may lead to excess weight. Remember the two-rib rule: you should be able to see the shadow of your Greyhound’s last two ribs. 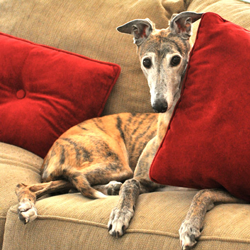 Age: Some Greyhounds over age 11 or 12 may lose their appetites as part of the aging process. Their sense of taste or smell may be less acute, and they may require a tablespoon of canned food or some other enticement to eat. Heat: Similar to people, sometimes dogs will react to extremely hot weather by experiencing a lack of appetite. Be sure to care for the special needs of your dog in hot weather. For more information, read Hot Weather Dangers. Metal Food Bowl: The sound of tags clanking on a metal food bowl can scare some dogs and make meals an unpleasant time. Bullying by other dogs: If you have multiple dogs in the household, always monitor feeding time. Dogs send signals with body language. These signals can be very subtle and easily missed by humans. Your dog, however, will not miss those small body and lip movements that signal one dog intimidating another during feeding time. Make sure your dog has plenty of exercise. A sedentary dog has little chance to work up an appetite. However, do remember to not feed for ½ hour before or after rigorous exercise. 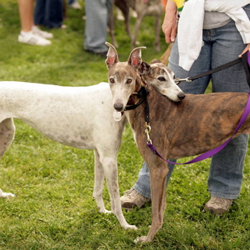 This is especially important with dogs such as Greyhounds who are prone to bloat (see the section above on Bloat). Be careful about putting pills/medicine in food. If your Grey scarfs up food without much chewing, you can probably get away with throwing meds in the food bowl. If, however, your dog spends more time with each bite, he will likely end up biting into the pill and being hesitant to eat any more. Don’t free feed (leave food out all day). Feed twice a day to keep blood sugar levels more even, and to make meal times specific events in your dog’s daily routine. Put a measured amount of food down, and take up anything that is not eaten within 10 minutes. Greyhound people seem to spend lots of time talking about greyhound poop; with some, the topic seems to border on obsession. One reason this issue is so frequently discussed is that what appears “normal” to some may look “icky” to others. And, when it comes to poop production, not all greyhounds are created equal nor do they necessarily create poop like other breeds. 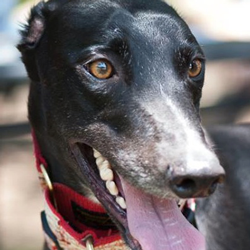 To help you with the delicate issue of poop, we have developed some guidelines about the appearance of greyhound poop. 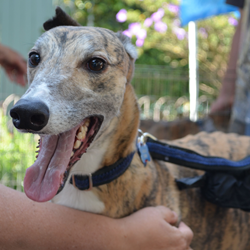 Remember, the first week or so that your greyhound is with you, he’s undergoing huge changes – food, water, location, companionship, “rules” and possibly even living with a cat or a child! Egads! Any of these are enough to derail his delicate digestive system for a few days. If poop does not seem to be improving in consistency and frequency, a good brand to try is Purina One Sensitive Stomach (a salmon, oatmeal and rice food). It is reasonably priced and seems to work well on greyhounds' delicate digestive systems. But remember to introduce the new food gradually over several days and anticipate that changing the food may upset the dog’s system again for a short period of time.If you feel that your dog has a serious case of diarrhea, contact Cathy Kiburtz or Sandy Hightower. And, if at any time, blood appears in the poop or the dog appears to have difficulty or pain when eliminating, contact Cathy and Sandy immediately. If the consistency is like soft serve ice cream, that’s fairly normal for a greyhound and may continue for several weeks. It is common if the dog poops a second time within 20 - 30 minutes of having had a more solid poop. If the consistency is like pancake batter for more than 2 - 3 days, then call Cathy Kiburtz or Sandy Hightower. They can advise you on an alternative treatment for resolving diarrhea. And remember, you can always call Cathy, Sandy or your Placement Representative if you have a concern about “poop” or any other aspect of your dog’s well-being. For more help, check out an article on this topic that includes photos: The Scoop on Poop. While or just after eating, the dog's stomach swells from gas or fluid, sometimes causing it to twist. If it's just a mild dilation of the stomach due to gas, it can be treated at home. If the stomach twists, however, the dog is in a life-or-death situation and must be taken to a vet immediately. Large, deep-chested dogs are particularly susceptible to bloat. 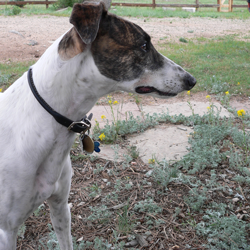 If your hound is able to belch or vomit, his stomach probably is NOT twisted. Signs that the stomach has twisted are similar to those above but more acute. The dog breathes rapidly, his mouth membranes are cold and pale, and he collapses. These signs are due to strangulation of the blood supply to the stomach. 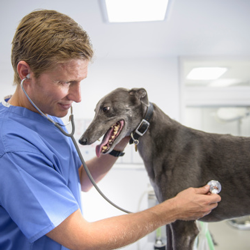 Rush your dog to the vet. Surgery will be necessary to relieve a twisted stomach. The stomach is opened up and the twist is unwound. Sometimes a portion of the stomach or the spleen must be taken out. The vet may staple the stomach in such a way that it is less likely to twist again. In nearly every case of severe bloat, the dog had a history of overeating, eating fermented foods, drinking excessively after eating, or vigorous exercise within 2-3 hours of a meal. Some experts recommend raising food and water dishes about 6 inches off the ground. Do not allow strenuous exercise immediately before or after eating. Some information taken from Delbert G. Carlson and James M, Giffin, Dog Owner's Home Veterinary Handbook, Howell Book House, 1983.